Though Lord Baden-Powell is always credited with having founded the Boy Scout Movement, he tells here how, like Topsy, it "just growed." 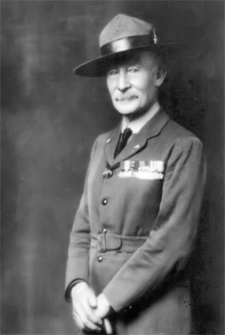 Lord Baden-Powell, the founder of Scouting, c1919. As a matter of fact I didn't actually start the Boy Scout Movement, because the blooming thing started itself unseen. It started in 1908 - but the microbe of Scouting had got me long before that. When I was a boy at Charterhouse I got a lot of fun out of trapping rabbits in woods that were out of bounds. If and when I caught one, which was not often, I skinned him and cooked him and ate him - and lived. The scheme worked. The men loved the training and Scouting became very popular in the regiment. In 1899 I wrote a little book called 'Aids to Scouting' for soldiers. It taught them observation, or how to track, and it taught them deduction, or how to read the information given by tracks. As one instance of observation and deduction, I told how my bicycle had been stolen one night in India and how I tracked it down and discovered the thief. In the early dawn I followed the track of the bike along a hard high road, not an easy thing to do if you look down on the road, but looking along the surface towards the sunrise one saw the track quite clearly ahead of one in the dew lying on the ground. The thief had led a bike by hand because the front wheel was locked and he evidently didn't know how to free it. His foot-marks alongside it were those of a soldiers boots, not a native's sandal. I observed that he passed the turning which led to the Cavalry Barracks, so I deduced that he was not a cavalryman; similarly he passed the road to the Infantry Barracks, but when he got to the Artillery road he turned up it and went into their Barracks. So I had only to tell the Adjutant of the Artillery that I believed one of his men had possessed himself of a very nice looking bike with a locked fore-wheel, and in a very short time my bikewas returned to me, having been found hidden under the bed of one of the men. "Father, I have shot you, you are not half a Scout. A Scout looks upward as well as around him - you never saw me." There was the boy, sitting up in a tree overhead; but far above him, near the top of the tree, was his new governess. " What on earth are you doing up there?" cried the General. "Oh, I am teaching him Scouting," she said. She had been trained at Miss Charlotte Mason's Collage for Teachers, and they had been using my book, Aids to Scouting, written for soldiers, as a textbook in the art of educating children. Then in 1907 I, as a General, was inspecting 7,000 of the Boys' Brigad at Glasgow on its twentieth anniversary, and the founder, Sir William Smith, was very pleased because the total strength of his movement was 54,000. I agreed that it was a big number but added that if the training really appealed to boys there ought to be ten times that number. "How would you make it appeal?" he asked. "Well, look at the young fellows in the Cavalry, how they enjoy the game of Scouting, which makes them into real men and good soldiers." "Could you re-write 'Aids to Scouting'," he wondered, "so that it would appeal to boys instead of to soldiers and make them into real men and good citizens?" So I did that. I told a friend what I was doing, and said that I wanted a quiet place, out of Press reporters and inquisitive people, where I could try the experiment; she offered me the use of her property - Brownsea Island in Dorsetshire. And there we set up camp for a fortnight. I had the late Major Maclaren and the present Sir Percy Everett to help me and we taught the boys camping, cooking, observation, deduction, woodcraft, chivalry, boatmanship, lifesaving, health, patriotism, and such things. The results upon the boys in that short space of time taught me the possibilities which Scout training held for boys. So I at once set to work and wrote the handbook, Scouting for Boys, intending it to be useful to the existing boys' organisations such as Boys' Brigade, the Church Lads' Brigade, the Y.M.C.A., and others. The book came out in fortnightly parts at 4d. a copy. Before many of the parts had been published I began to get letters from boys who had taken up the game for themselves, boys not belonging to the Boys' Brigade or any other association. In that year, 1909, I arranged to have a meeting of the would-be Scouts at the Crystal Palace on a certain day. And when I got there, my wig, there were a lot of them. Rain was threatening, so we mustered them inside the Palace and arranged a March Past and counted them as they entered at one door and went out at the other. There were 11,000 of them - 11,000, who had taken it up of their own accord! That is why I say that one didn't see the start: Scouting started itself. Then, among the boys as they marched past, we found some groups of girls in Scout hats with staves and lanyards and haversacks, like the boys. "Who are you?" we said. "Oh, we are the Girl Scouts." "The devil you are!" "No - Girl Scouts." So I had eventually to write a book for them giving them the name of Guides to distinguish them from Scouts. And that is how the Girl Guides started - on their own - and they have gone on growing ever since. Soon we began to hear from the Oversea Dominions and Colonies that they were all taking up Scouting, and before long foreign countries too were translating Scouting for Boys and playing the game. In 1912 I had to go on a tour through America explaining the movement in twenty-four states. And I went on to Canada, Australia, and South Africa, preaching Scouting where they had all started it, but wanted to know more about it. It was wonderful. Lots of people, of course, took to criticising the rapid rise of what they called a mushroom growth, and prophesied that after the first excitement it would gradually decline and probably die in the fifth year. and do service for their country in the time of its need. Our danger was that enemy spies in the country would try to upset our war preparations by blowing up railway bridges, cutting telegraph lines, and so on, and at once Scouts all over the country mounted guard to protect such communications by day and night. Others were used as orderlies and messengers in government offices to replace men sent to the Front. The Admiralty asked if we could send Sea Scouts to take over the coastguard stations and so release the naval ratings there to return to active service with the fleet. Luckily we had prepared a big rally of Sea Scouts in the Isle of Wight for the Bank Holiday of August, 1914, and the Great War, you may remember, broke out on that date. So we were able to send off detachments at once to take over all the coastguard stations, from John O'Groats to Land's End. These detachments were mainly patrols commanded by their own boy leaders. We had some 25,000 boys doing their duty during the course of the War. They did their work thundering well, and after the War was over received the thanks of the Admiralty and of the King for their services. So, instead of dying, the movement showed its vitality; it rose to the occasion and since then has gone on growing in strength and usefulness. We have now 1,011,923 British Scouts and 544,544 British Guides. In addition to these, some fifty-two countries have taken up Scouting and many also have Guides, so that altogether in the world there are now 2,812,00 Scouts and 1,304,107 Girl Guides. It should be remembered, too, that behind these there are many millions more now grown-up in the different countries who have been in the fellowship of the Scouts and Guides. But what is more important than numbers is the fact that these Scouts and Guides of all countries have arrived at the stage of being on very friendly terms with one another. The ... American Jamboree, in Washington this year, of 28,000 boys, followed by the World Jamboree in Holland of another 28,000 (which thirty-two countries attended, all at their own expense), shows the enthusiasm of the boys for making friends with other nations. There is in the movement that spirit of happy good comradeship which cannot fail in bringing about what we all pray for - Goodwill and Peace in the world.